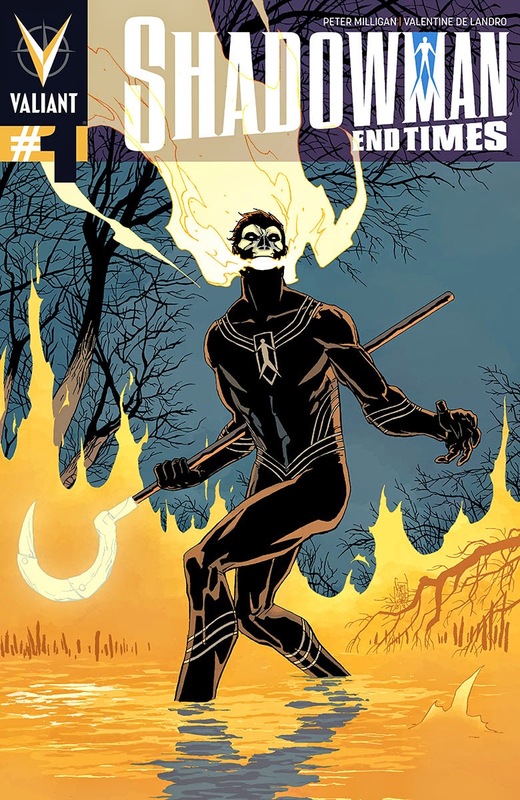 Elkin: Taking a look at the cover of Shadowman: End Times #1, all I can think of is Shadowman: High Times #1, amirite? That's about all the levity you’re going to get out of me for the rest of this review, Wunderlich. I was all aboard Milligan's Shadowman way back when – I remember being so agog about issue #13 way back in December. But something happened in the interim. I know I've been changing, but dammit Milligan, you've been changing too. What started off with such promise seems to have embarrassingly soiled itself somewhere along the way, and now everyone is uncomfortable sitting next to it unsure whether to flee in disgust or extend a hand of assistance. What was once taint-tightening horror has become elbow moisturizing dull. What had bubbled with a certain level of excitement now has gone flat like a Pabst left open two weeks in the sun. What crackled with the fire of artistic intent has been suppression foamed to the point of OMG that cliché is still cliché. And I can't tell you how disappointed this has made me. It's like those menus that feature pictures of all the entrees and the photo of the Monte Cristo is so alluring and beautiful that you salivate buckets the longer you stare. Then they bring you the actual sandwich and it looks like something you find at the bottom of your former mother-in-law's sock drawer while helping her move to the dementia ward at the local rest home. Now Milligan has done it to comics. Dialogue: Predictable. Plot: Well-worn. Characters: Wooden. My Interest: Zero. Then there is the art. Valentine De Landro isn't Roberto de la Torre. Were it not for the work of colorist David Baron and letterer Dave Lanphear, I would have probably only given this book a single star. Two more issues to this series? End Times is right. When it was announced Milligan would be taking over Shadowman I was overjoyed. The great Valiant re-launch had very few misfires thus far—I was expecting great things. Then this happened. Then this. At the risk of repeating myself ad nauseam, Milligan has disappointed on all fronts. With End Times we’re assured that every bit of story that had potential (the child-kidnapping loa, for example) is, or will be wasted. I was excited to learn about past iterations of Shadowman, the rogue loas and the rich lore that was built by the previous series. Despite Milligan’s many misfires, I thought eventually he might deliver on at least one of those story elements. The good news? He almost piques my interest here. We get a taste of the previous Shadowman and it’s almost entertaining. Unfortunately this book is so poorly composed—I’ve lost all hope. Yes, the evil child-kidnapping loa was a cool concept. Milligan, however, completely underwhelms with his big showdown and any potential that character and/or story thread had is lost. Any potential this mini had is lost. Any chance to appreciate Valentine De Landro’s art, reading another issue of Shadowman or buying another Peter Milligan book anytime soon—lost.